Standing for the National Anthem is part of the job. Players are entertainers, paid to perform per standards set forth by their employers and, in this case, the NFL. If the player doesn't want to perform to the standards, the employer is free to fire them for breach of contract. It cannot be part of anyone's job to support or express opinions which are not his own. very recently. Though the owners have now made it part of the job, that doesn't mean they have the right to force that upon the players. NFL players are not paid to stand during the anthem. It is not during the actual play time of the game. And the players are respectfully utilizing their limited platform to the benefit of less fortunates. Kaepernick used to sit out, and there was no controversy there. So, standing for the Anthem is not reasonably part of their job. 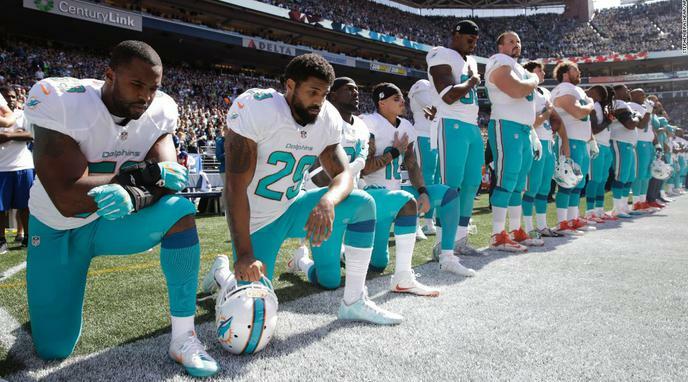 The question is whether football players deserve the First Amendment right to make a demonstration. It may well be in the league/team's legal right to fire players who don't stand for the anthem. But that doesn't change the fact that kneeling may be the right thing to do. Employers do not have an absolute right to determine what their employees "do during work." There are numerous laws that limit this right and protect the rights of employees.